The trip from Bormio to the top of the Gavia was a grim one – steady rain and thickening fog towards the summit. He was afraid they would not even be able to make the tricky descent to Legno, but – surprise – the other side was clear of both rain and fog. The sky was clearing up and the sun showed itself – good signs, but his doubt about his physical condition remained. So, he promised himself to take it easy from the start, get to the top of the Gavia and (perhaps) call it day there, depending on how he would feel by then. Since the first stretch of 4 kilometer or so (until Sant’Appollonia – see the profile) the climb is not so demanding, he fought his urge to shift up a couple of gears and remained calm. And a good thing he did too – the remaining 12 kilometer has an average of close to 8%. That’s not too bad, but the short stretches of 12 – 14% are frequent. Maintaining a steady pace, keeping a close eye on his heartbeat, he managed to get to the summit surprisingly ‘fit’. After a coffee and a sandwich, he decided that he would also take on the Stelvio today. 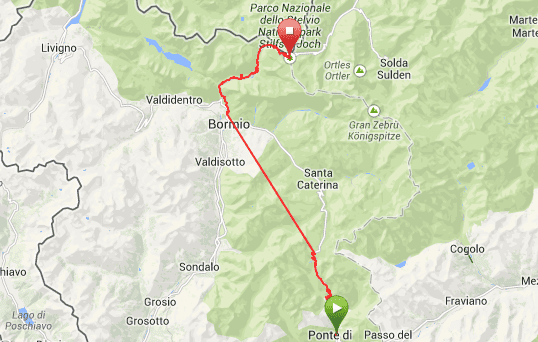 That climb – from Bormio – is already scheduled for Sunday during the ‘Mapei Day’ too, but just in case the weather would be bad, he wanted to make sure he had done it anyway. They headed back to Bormio and in ‘Tornante 40’ he climbed back on his bike. He forgot to start the timing on the Garmin for the first kilometer or so, but that’s a freebie anyway (up untill the split with the road to Livigno – see the profile). By this time, the temperature had actually risen to around 30 degrees Celsius, which was quite a bit higher than during the Gavia. This needed some ‘acclimatization’ to avoid his heartbeat going up too much, but he managed. Report of 2015’s trip up the Gavia from both ends consecutively here. Report of 2008’s climb from Prato here and from 2015’s trip up the Stelvio from both ends consecutively here.